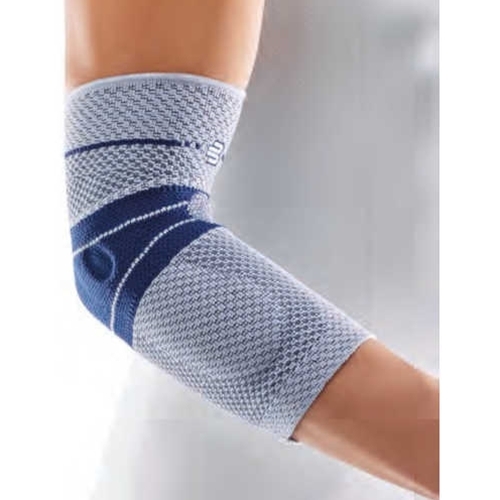 Bauerfeind EpiTrain Elbow Support Brace from HealthyKin.com is our most popular elbow support, worn by many professional athletes. Size 0: 6½ to 7½"
Size 1: 7½ to 8¼"
Size 2: 8¼ to 9"
Size 3: 9 to 9¾"
Size 4: 9¾ to 10½"
Size 5: 10½ to 11½"
Size 6: 11½ to 12¼"
Fitting chart inaccurate. Company did not allow me to exchange for a different size. Do not use this company. It's a really neat brace, but found for my arm it was too tight towards the wrist and too loose above the elbow, So returning it. My lateral medial epicondylitis (knobby inside elbow bone) was still vulnerable andI will continue to search for a support to protect it. Great product but could use more support above the elbow, otherwise fantastic.